It has been suggested that this article or section be merged into Queen Buzzerfly. 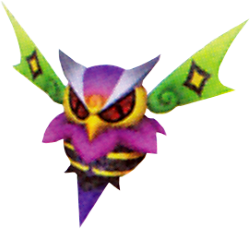 The Buzzerfly is a Dream Eater that appears in Kingdom Hearts 3D: Dream Drop Distance. It acts as a minion to the Queen Buzzerfly during Riku's Dive to La Cité des Cloches and Sora's Dive to The World That Never Was. It does not have a journal entry. 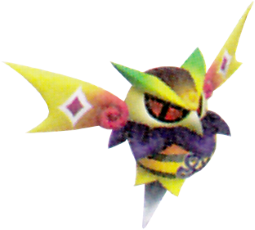 The Buzzerfly was originally created as a much smaller common Dream Eater before being reintroduced as a Dive Mode boss. During battle, the Buzzerfly would have sat in the eye of a needle and spun like a top. The Buzzerfly is a general hybrid of a butterfly and a bee. It is shorter and stubbier than the Queen Buzzerfly, with a simplified color scheme. It is almost owl-like in appearance, with a drill-like stinger and a plump abdomen. Hachi (蜂?) is the Japanese word for bee. This page was last edited on 3 April 2019, at 16:56.